Information provided by the Helpline services is for personal use by you in making your own decisions and must not be used without validating the information from appropriate sources including obtaining professional advice where relevant. You should make and rely upon your own assessments and enquiries to verify the accuracy of the information provided. The email and Webchat services do not provide medical advice, diagnosis or treatment of any conditions. The National Dementia Helpline does not accept any liability for any injury, loss or damage incurred by use of or reliance on the information provided. We will need to disclose your personal information to the relevant authorities if we become aware that there is a child or young person at risk of harm (including physical, sexual, emotional, psychological abuse or neglect); or there is a serious risk of harm to you or another adult person. While taking all due care, Dementia Australia does not warrant that the online support services are free from any computer viruses or other defects. You agree that your use of these services will be respectful, will not be inappropriate and will not violate the rights of others or legal requirements. The National Dementia Helpline retains the right to terminate contact if this is breached. 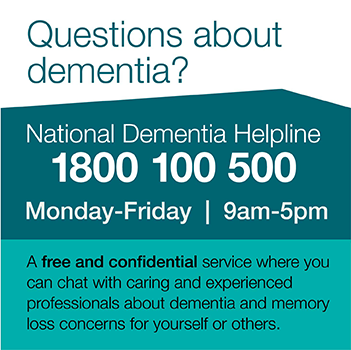 If you have questions about the National Dementia Helpline email or Webchat service, please send your feedback here.